Weaning and extubation are terms that are commonly encountered in critical care. In an intensive care setup, weaning is a process in which a patient is suspended off the ventilator following resolution of illness, whereas extubation refers to the removal of the endotracheal tube from the trachea. Although both these processes follow each other closely in clinical practice, it is essential to understand these terms as two discrete processes that pose distinct problems. 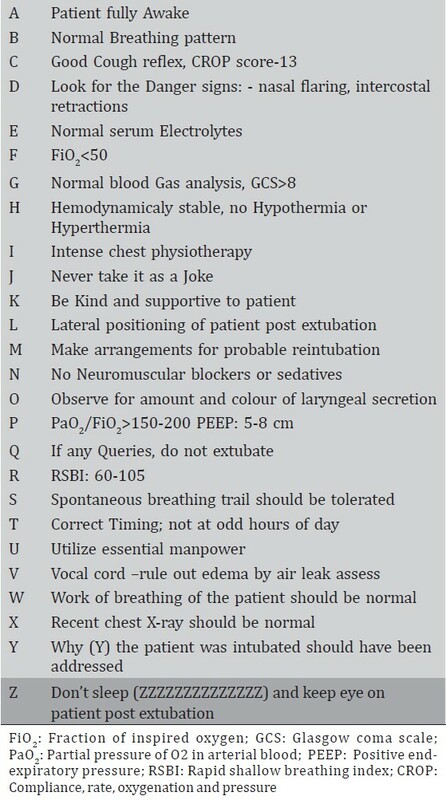 In this letter, we describe a self-formulated algorithm using English alphabets as a checklist to be used as a guideline prior to extubating a patient [Table 1]. The checklist depicted in the algorithm would help minimize complications, improve patient care and reduce the risk of reintubation. We conclude that the above formulated algorithm may be helpful for residents and staff working in the intensive and critical care setup by providing an easy and quick checklist prior to weaning process for prevention of failed extubation and decreasing the morbidities associated with it. The authors contributed equally to the paper and confirm that they have read and approved the final version of the manuscript. Smina M, Salam A, Khamiees M, et. al. Cough peak flows and extubation outcomes. Chest 2003;124:262-8. Martinez A, Seymour C, Nam M. Minute ventilation recovery time: a predictor of extubation outcome. Chest 2003;123;1214-21. Epstein SK, Ciubotaru RL, Wong JB. Effect of failed extubation on the outcome of mechanical ventilation. Chest 1997;112:186-92. Esteban A, Alía I, Gordo F, et. al. Extubation outcome after spontaneous breathing trials with T-tube or pressure support ventilation. Am J Respir Crit Care Med 1997;156:459-65. Seymour CW, Martinez A, Christie JD, Fuchs BD. The outcome of extubation failure in a community hospital intensive care unit: a cohort study. Crit Care 2004;8:R322-7. Torres A, Gatell JM, Aznar E, el Ebiary M, Puig DL, Gonzalez J, et. al . Re-intubation increases the risk of nosocomial pneumonia in patients needing mechanical ventilation. Am J Respir Crit Care Med 1995;152:137-41.